The BLADE Show is proud to announce a BLADE Magazine Knife-Of-The-Year® award new for 2014: the People’s Choice Award. 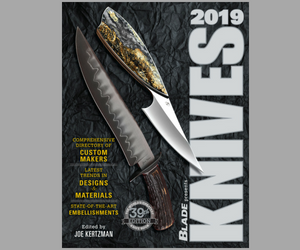 It, along with the other Knife-Of-The-Year Awards—all sponsored by New Graham Knives—will be chosen during the 33rd Annual BLADE Show June 6-8 at the Cobb Galleria Centre in Atlanta. Designed as a way to get the rank-and-file of knife enthusiasts everywhere involved in the selection of one of the industry’s most coveted factory knife honors, the People’s Choice Award will be determined by a vote of knife enthusiasts via the BLADE website, www.blademag.com. Stay tuned to the site for more details on how you can participate. Only factory knife and factory knife accessory companies with booths at the BLADE Show are eligible to enter the competition for the BLADE Magazine Knife-Of-The-Year Awards. The 13 other awards are voted on by BLADE Show booth exhibitors, with the exception of the Publisher’s Award and the Industry Achievement Award, which are named by the staff of BLADE® Magazine. KNIFE-OF-YEAR DISPLAY DEADLINE MOVED UP! Entries for the Knife-Of-The-Year Awards are exhibited in the Knife-Of-The-Year Display area in the show hall of the Cobb Galleria Centre for all show patrons to see. The deadline for factory booth exhibitors to have their Knife-Of-The-Year entries on display in the area has been moved up to show Friday at noon this year from the 4 p.m. Friday of previous years. The change is due to the People’s Choice Award, which will require the BLADE Show staff to photograph ALL of the entries and post those images on blademag.com for knife enthusiasts to study before placing their vote for the award. For the latest knives, knife news, trends and more, stay tuned to www.blademag.com. Will the People’s Choice Award be a poll of those registered on this website? Will it be new factory knives? Will it be a poll of just certain knives? When will you have the poll up? Blade Show is only 50 days away. Thanks for the question, RamZar! The game plan right now is for us to photograph each and every entry in the Knife Of The Year competition and then post those photos on our site for site visitors to choose from to vote on. The competition can be entered ONLY by BLADE Show booth exhibitors and the knives must be factory made and otherwise meet all Knife Of The Year entry rules. Entry deadline is noon Friday, June 6, and we will get all the photos of the knives on our site as soon as possible after that for site visitors to vote on. To quote the rules, “knives and knife accessories available for sale to the public on or before June 3, 2013, or that have been entered in a previous Blade Magazine Knife of the Year competition, are ineligible.” Site visitors will vote on the People’s Choice Award and the People’s Choice Award ONLY. The other Knife Of The Year Awards will be voted on by BLADE Show booth exhibitors as they have been for many years. Meanwhile, we reserve the right to amend the rules as needed. I hope this answers your question.